Denzel Washington is one of the great actors of his generation so how he got involved in this muddled film, with its grandiose dialogue and meandering narrative, is a real head-scratcher. Even more puzzling is why he agreed to use make-up and wear a costume (complete with a fat suit) that makes him appear like he's auditioning for a Klump in another Nutty Professor sequel. 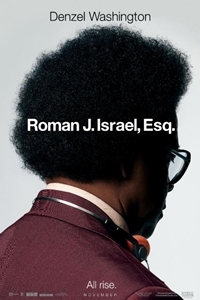 At its heart, Roman J. Israel, Esq. functions as an apologia for lawyers that goes something like this: at the start, many get into law with the most principled of motives but, even if they become sidetracked along the way, that spark of nobility remains. This is voiced in a several heartfelt monologues delivered by Washington including a climactic one that is pure gobbledygook. While listening to it, I experienced a wtf? brain cramp - I couldn't figure out what he was trying to say. I usually give writer/director Tony Gilroy the benefit of the doubt because he has scripted some of my favorite films but Roman J. Israel, Esq. is a few steps too far in the wrong direction. The story is surprisingly unfocused and, when it snaps out of the protracted setup phase, it plunges into quasi-thriller territory that relies on a series of hard-to-swallow contrivances. And, although it's fine for a character to be wreathed in ambiguity, it's a problem when the screenplay doesn't know what to think of him. At times, Roman J. Israel, Esq. wants us to sympathize with the lead while, on other occasions, it treats his naivete with contempt. The ending is supposed to offer a sense of closure but it only added to my frustration about a production that couldn't make up its mind about what message it was conveying and how it was conveying it. The movie opens with a close-up of a confused legal brief being drafted by the lead character, Roman J. Israel, as Denzel Washington reads the text for those who are too lazy to do so for themselves. The narrative then jumps back three weeks to a defining moment that derailed Roman's life and career. His long-time law firm partner suffers a catastrophic heart attack that leaves him in a vegetative state. High profile defense attorney George Pierce (Colin Farrell) takes over for the dying man and, determining the firm to be insolvent, disbands it. Roman, needing money, is forced to accept George's offer of employment after being turned down for a salaried position at a civil rights project headed by the pretty, idealistic Maya Alston (Carmen Ejogo). After struggling for a time in his new role, Roman comes into possession of some information that, if used, could net him a $100,000 reward. After wrestling with his conscience for two minutes of screen time and deciding that after a lifetime of self-sacrifice he deserves a slice of the good life, he contrives a way to get the reward and starts spending: new suits, new shoes, and a new high-end apartment. He cuts his hair and adopts a cynical world-view - something that George finds pleasantly surprising. Maya, who has kept in touch, is confused by the mixed messages she is getting from Roman. But when Roman's secret is outed and he finds himself unable to keep up the morally bankrupt façade, he faces a crisis of conscience that could cost him not only his career but his life. This is the kind of role Washington could do in his sleep, and that doesn't seem far from the way he approaches it. His portrayal of Roman is dull and laconic, a distant echo of the fire and energy Washington has brought to the roles of other civil rights battlers (Rubin "The Hurricane" Carter, Malcolm X). Colin Farrell, whose multi-layered portrayal was a highlight of the recent The Killing of a Sacred Deer, has trouble with George's shifting morality and the greedy lawyer's abrupt about-face feels more like a writer's construct than an organic personality change. Carmen Ejogo's Maya seems like she emerged from a writer's word processor. She's not a person; she's Roman's conscience. After the movie was met with a negative reaction at its Toronto Film Festival debut, Gilroy re-edited things into the version being released into theaters. Among the changes: re-sequencing certain scenes and shaving more than ten minutes off the running time. It hasn't helped. The pacing is still erratic with far too much set-up and a payoff that, at best, is unsatisfying. The performances are lackluster and the story's thriller aspects fall somewhere on a continuum between "implausible" and "moronic." This is a disappointing effort from all involved and, despite a release that hints at Oscar hopes, no one is going to nominate this for anything (unless it's a Razzie).